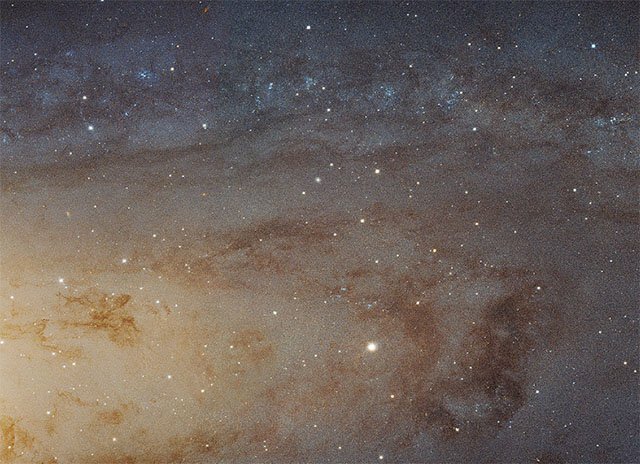 NASA has released the largest and sharpest photograph ever made of the Andromeda Galaxy, the nearest spiral galaxy to ours that contains an estimated 1 trillion stars. The new image (above is a crop showing a portion of it) weighs in at 1.5 gigapixels (i.e. 1.5 billion pixels); it’s so big that you would need 600HD televisions to display the entire digital photo. Captured by the Hubble telescope, the image reportedly shows over 100 million stars and thousands of star clusters. And keep in mind that this is just a 40,000 light year section of the whole spiral galaxy. There’s no good way to display the image here that will do it justice, so you’ll have to visit this interactive zoomable photo browser to explore the image for yourself. For an easier way to experience the sheer scale of this image, check out this 4K video created by YouTube user daveachuk. He took the 4.3 gigabyte photo and created a video fly-through that will give you a jaw-dropping tour in about 3 minutes. Keep in mind that every little dot you see in this image is a star, and researchers have found that virtually ever star has at least one planet orbiting it. Many of those planets also have moons. And this is all found inside a single galaxy.